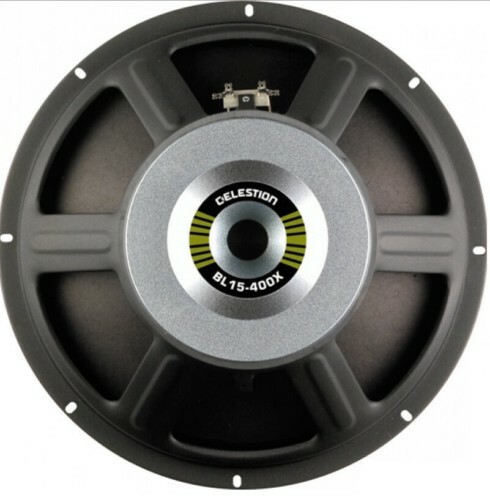 The Ferrite magnet 15 Inch BL15-400X Green label bass speaker gives 400 watts power handling with the same classic rounded rock sound with the tight low end definition that is associated with Celestion drivers. The Green Label 400X provides exceptional linearity and superb bass extension and this speaker has been our first choice driver for upgrades in Ampeg, Peavey and Trace Elliot 1 x 15 cabinets giving a huge 400 watt rms handling. This speaker is ideal for those bass players who want plenty of top end detail with a traditional warm rock sound. It works well for funk players who like to slap and pull and does not sound over bright even when using an active bass.